In my last blog I looked at how the public could choose charities to donate to or volunteer for. In this one, I wanted to look at how charities can tell people what they want to know, based on what our Public Trust and Confidence report said. We published a sample survey on how well charities were doing on public benefit reporting, ie reporting on the impact they made, earlier this year. A lot of charities explain what they do (their activities), but don’t really explain how what they do makes a difference (their impact). A strong narrative about how you made an impact and an honest assessment of where you didn’t and are changing tack as a result next time are two key things we would look for. Read our guidance here. Small charities may want to use our template for charity accounts and annual reports as our work has shown that charities using those have a better quality of accounts. Those templates help you tell your story well. (If you don't account on a receipts and payments basis, there are examples of the new SORP here and we will be publishing a new template later in the year.) 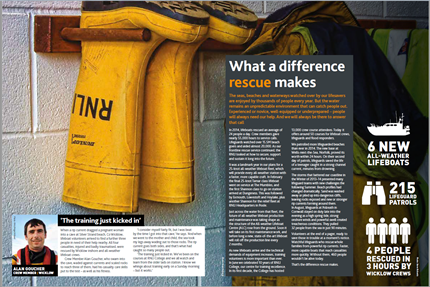 In the example below, RNLI explains in its Annual Report the difference it has made. 2) What will you do with money you raise from the public or with the time and energy of volunteers? Most donors and volunteers want to see what your plans are for the year that they’re donating as well (public targets)– so that they can check back next year and see whether you’ve achieved what you set out to do. Whether you are publishing them as part of your annual report, or on your website, a clear direction helps people support you. 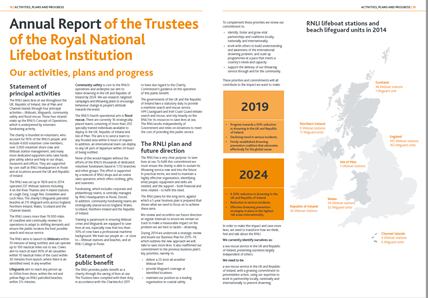 In the example below, also from its Annual Report, RNLI commits towards a 50% reduction in drowning. There are no rules on the absolute amount of money you spend on support costs governance and fundraising, but it does matter to the public, so you can link from your website to our pages that show your accounts broken down by spending, support costs, governance and so on. 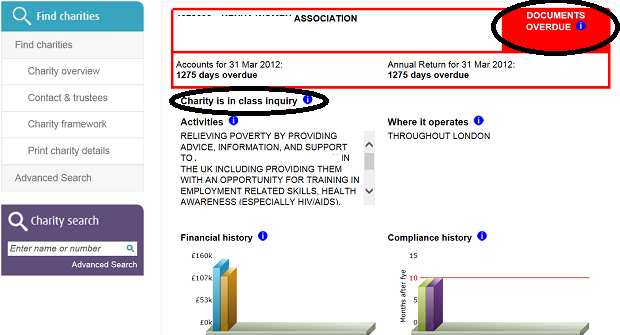 This demonstrates accountability and you can also link to our website to show your accounts are in. If you don’t file accounts for two years in the row, you may be automatically investigated in a formal Inquiry which will show up on our register; having a red ‘Documents overdue’ flag on our register also sends the wrong message to donors and media. Stop problems happening by keeping on top of our best practice guidance and making sure your trustees are too. Get all your trustees’ email addresses to us so that we can send them quarterly updates on our new guidance. What else do you think charities could do to improve trust and confidence around accountability? And how can the Charity Commission help, through our Register and in any other areas? We’d be very interested to hear from you.